With immense market knowledge, we have been able to provide optimum quality Horn Photo Frame. 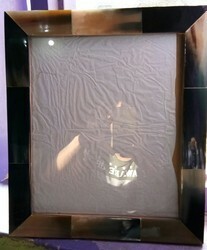 Water buffalo horn in bold black and ivory forms a contemporary photo frame with natural appeal. Featuring a protective glass pane, the frame can hold a vertical or horizontal 4x6 inch photo. With enriched industrial knowledge, we have been able to offer a wide spectrum of Horn Photo Frame. Frame the moment of the life with Horn Photo Frames and make it memorable for lifetime. Owing to their intricate designs and patterns, Horn Photo Frames are best for gifting as well as decoration. We offer Horn Photo Frames in different sizes and designs to meet divergent demands of the clients. 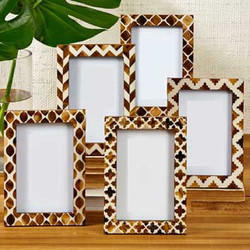 These are thick bordered bone and horn inlay photo frames. Their slight imperfection is due to the fact that they are hand-crafted. we are offering a wide range of baffalo horn photo frames in deffrent colors, designs and sizes. These items are elegantly designed at our state-of-the-art manufacturing unit using only high quality of raw materials. we also customize frames as per the customer requirements. We engaged in making Horn Photo Frames, which is appreciated by international clients due its quality, price, finishing and designs. These photo frames made by Buffalo/ ox/ cow Horns and in various designs as per client requirements. Our PhotoFrames available in all sizes as per our client. We can modify this product.